IMPORTANT: We are not Visa or MasterCard, the companies who supply 3D Secure. Our accounts simply integrate into their verification system as part of our online payment solution. Therefore we are unable to answer ANY 3D Secure questions or issues. If you are having problems with 3D Secure then please contact Visa, MasterCard, the website owner or your original account provider. You can reduce your exposure to fraud by using '3D Secure'. If your customers join 3D Secure, or you force them too, then you can use this feature to identify shoppers as genuine and honest cardholders, before they pay for their online purchase. This reduces fraud, and increases a shopper's confidence in your site. This page provides an introduction to 3D Secure. It is recommended that all members and merchants read this section and download the guide at the bottom of this page. The 3D Secure feature enables the shopper to enter a password to confirm their identity with the card issuer. If accepted they then complete their order, and when received by you, you have much more confidence that is genuine and real. If you are enabled for 3D Secure (Verified by Visa and MasterCard SecureCode) you can be protected from certain "it wasn't me" Chargebacks on credit, and some debit, card transactions. According to Visa, over 80% of all chargebacks fall into this 'friendly" fraud-related category. Liability for this kind of chargeback passes from the merchant to the card issuer, even if the card issuer is not a participating member of the scheme, or if the cardholder is not enrolled. "a real benefit is the assurance members can provide to their cardholders who are considering e-commerce transactions"
What does 3D secure stand for? 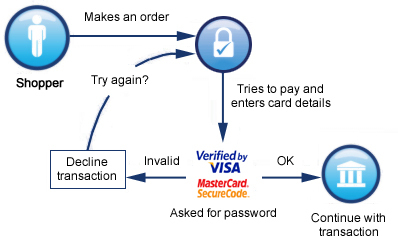 The 3-D Secure™ protocol was developed by Visa to improve the security of Internet payments. The protocol is offered with the service name Verified by Visa. MasterCard has also adapted a similar protocol called MasterCard SecureCode. Both are designed to allow authentication of cardholders by their Issuers at participating merchants. 3D secure is available with all of our accounts and no extra development work is required on your site as the process is identical to our standard online payment process, with the exception that we will automatically detect if the cardholder has enrolled to the 3-D secure scheme and will prompt for additional card details. If you are currently using a full API integration some slight integration work may be needed. The American Express SafeKey® programme ("SafeKey") is a Payer Authentication service that adds an extra layer of security when a participating Cardmember shops online. SafeKey reduces unauthorised online use before it happens by validating the Cardmember’s identity with an additional password or unique value. What kind of security authentication methods does American Express SafeKey support? Is American Express SafeKey aligned with industry standards? Yes, to facilitate ease in certification of American Express SafeKey and minimize development costs as much as possible, SafeKey has aligned with industry standards. Issuers, Acquirers and Vendors should find American Express’s 3-D Secure solution to be virtually the same as others in the payment industry. Where is American Express SafeKey available? Additional markets will be added based on Merchant/Issuer requests, market capabilities and governmental regulatory requirement.